Sensata Technologies presented the new MHM5 and MHK5 absolute multi-turn encoders with either Ethernet/IP or ProfiNet interfaces for Factory 4.0 applications. The flexibility is provided thanks to the possibility of either shafted (MHM5) or blind shaft (MHK5) configurations. These model MH encoders provide up to 16 bits per turn and 14 bits of turns counting. 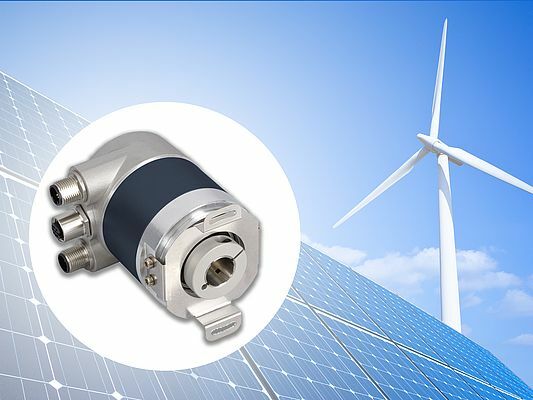 The compact packaging allows these encoders to be easily integrated into existing designs while a wide operating temperature range (-40 to +85C) and an IP65 rating makes them suitable for most any industrial application. Included in the design is a geared turns counter that is immune to electrical or magnetic interference. In addition, these encoders feature reverse polarity and short circuit protection as standard. These robust specifications help to ensure highly reliable and accurate speed and position sensing across many industrial processes. Multi-turn encoders are used in packaging applications where they help to identify the position of products along the process line to determine when the machine needs to take an action such as to die cut, mark, slit, inspect, singulate, and/or stack. Another common application when encoders are used is in metal forming – such as determining the absolute position of strips, bars, rolls or tubes of metal being carried along a process, that need to be marked, scored, slit, inspected, or formed. Absolute multi-turn encoders like models MHM5 and MHK5 are also often used to determine the angle of rotation and position of a crane boom, as well as the amount of cable payout. They are also useful in heavy vehicles for off road mobile platforms, construction and mining equipment, where proper placement and operation of equipment is critical to the success of the project. To learn more about these new encoders, review the specification sheets or check out application notes, visit www2.sensata.com/mh-encoders.